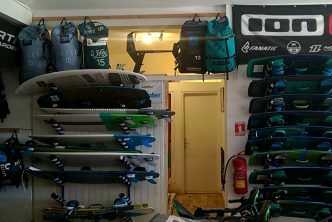 Many people looking to get into kitesurfing wonder how much exercise they will get from the sport, and if kitesurfing can replace their current workout routines. Is kitesurfing a good workout? Although you can easily kitesurf without being an athletic person at all, kitesurfing can give you a very intense workout depending on wind and water conditions and on your riding style. It’s more a muscular than aerobic kind of workout, heavily exercising your core muscles and lower back, quads and calves. Let’s go through some of the things that affect the kind of workout you’ll get through kitesurfing, and how it compares to some other activities. What kind of workout is kitesurfing? The muscles that kitesurfing works the most are you core muscles, that is your ab muscles, lower back muscles, deeper core muscles such as the transversus abdominis and the multifidus, and your leg muscles – quads, hamstrings, and calves. These muscles get strongly engaged especially when carving upwind, pulling hard into your harness creating tension in your lines by pushing your board away from your kite. The amount of workout you get on these muscles depends on your riding time and on how much upwind riding you do. Most kitesurfers feel quite sore after a good session, and until you build up your specific core muscles, you may even feel your abs and ribs hurting a bit for a couple of days after such a session. Kitesurfing typically will not give you a strong aerobic workout, except for specific riding styles (see below). It’s common to see less than fit people riding back and forth without issues once they master the basic upwind riding techniques. So if you’re looking for a good cardio workout, you may want to complement kiting with other sports. As you’re learning to kitesurf, you keep crunching your core muscles hard to position your kiteboard for each water start, and to stay balanced on your board, adjusting your stance and body rotation/inclination to the amount of pull you get from your kite. You also tend to push very hard on your legs during water start, often more than you should, leading to failed starts. During all these events, you typically create tension in your core and leg muscles. Because of that, you might initially get the feeling that kitesurfing is a tough workout, as you often get significant soreness and fatigue the night and day following your session. Newer kiters also feel soreness in their neck from staring at the kite all the time. You may also feel the strain on your knees while building up your ligament and muscle strength. As you progress through the learning, however, you begin to master the water start and board carving/edging techniques and start to relax more. This helps to eliminate a lot of the muscle soreness and tension. The longer you start riding and the more you stay upwind, the more your workout shifts to your glutes, quads, and core muscles for keeping your board edging. How much of a workout you get from a kitesurfing session heavily depends on the weather conditions you ride in. Kitesurfing in nice, moderate, steady wind on completely flat water in the Caribbean is very pleasant but can be close to “a walk in the park”. A person with a beer belly and no endurance can achieve it once they master the technique. Riding in strong and/or gusty winds, however, is another story. Strong winds require you to continuously pull into your harness to compensate the pull from the kite. Constantly changing your core muscle tension in response to wind gusts (or lulls) feels like the equivalent of doing crunches. Aside from abs, deep core and lumbar muscles, your hips are heavily engaged when trying to edge on your board in stronger or irregular wind. Trust me, a kitesurf session in 25+ knots will wear you out. The constant and strong pull from your kite is exhausting. In such conditions, I typically go back to the beach and take a rest once in a while, to give my lower back and quads a break. I may just sit on the beach for a few minutes with my kite up – which only gives me a relative rest since my kite keeps pulling even if depowered. Or if I feel really tired, I’ll have someone land it, which means a longer break. Using a more powerful kite has a similar effect than riding in strong wind in terms of workout: a bigger kite for the same amount of wind will give you more power and pull. It will require more core and leg muscle from you to resist the pull and edge upwind, but you’ll be able to get more speed and more air when jumping. Rough water and waves also add to the workout you get from kitesurfing. Riding in choppy water (see this post for more) requires constant adjustment of your position and pressure on your board, making you perform squat-like movements after each bump you cross. Going over waves also make you work your core and legs harder, sometimes forcing you to jump which involves a lot of muscle and cardio power. Overall, your heart and lungs also get much more of a workout when riding with an overpowered kite or fighting through chop and waves. 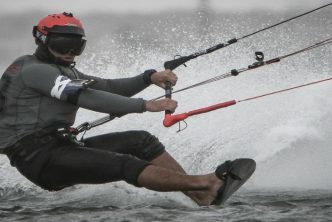 I mentioned earlier that how you ride affects the amount of exercise you get from kitesurfing. One practice that really makes kiting much more athletic is doing tricks and jumps. Jumping is a very muscular activity and works your upper abs like crazy, your forearms – from pulling hard on and holding the control bar – and your thighs and calves – when edging up hard for jump setup. When jumping you also breathe in deeply to keep your muscles and brain working during the flight and make steering decisions in mid-air for longer flight time and soft landing. Jumps will get your heart and lungs pumping and get you out of breath. Doing lots of jumps throughout your kitesurfing session, e.g. on every tack, will result in a much more intense and exhausting workout – high jumpers commonly have sessions no longer than 1-2 hours. Downwinders are another type of riding that will seriously boost your kitesurfing workout. Riding downwind requires you to keep your lines tensioned to avoid your kite losing power or dropping when riding towards it (wind direction), so you need to carve hard turns continuously. Doing so over several miles, especially with a well-powered kite (big enough for the wind), will work your core and leg muscles very hard and provide an intense cardio session. In general, riding with a powerful kite, doing a lot of edging, jumping and flying, doing spins and flips, will work a lot more muscles and get your heart pumping. So kitesurfing can give you an intense workout but you do need to have enough wind and to ride in a more athletic style to really get the amount of muscle and cardio work you want. Can kitesurfing replace your current workout routine? Well, for one thing, that will partly depend on how many days of wind you get per week at your local spot – and how much freedom you have to take advantage of them. It may be hard to do your regular weekly gym workouts during a period of strong winds where you’re able to kite several days in a row. When that happens, my abs and legs typically feel too exhausted for me to be able to do my usual squats, deadlifts, pull-ups etc routine. I get very bored at the gym, though, so whenever the conditions are there I’d much rather go kiteboarding. However, I don’t take kitesurfing as a replacement for my normal workout training, namely for cardio. I try to continue my rope jumping and stand up paddling routines in parallel – I’m not a big fan of running or cycling but of course, those would work fine for aerobic workouts as well. One important aspect I want to mention is that for me, cross training for kitesurfing has been vital. I had to help build up my glutes and quads muscles and knee ligaments, which were quite weak, to get rid of that strong pain for a couple of days after each kitesurf session – getting on a strapless surfboard also helped a lot. Another thing was lower back: lumbar muscles can get exhausted after overpowered kiting sessions. If you overdo it, you may end up having your spine joins do some of the work in place of your core and hip muscles, potentially resulting in nasty spinal problems. To avoid them, I try to do a serious warmup and stretching before and after each intense kitesurf sessions, particularly in stronger wind or bigger waves. I highly recommend doing so, regardless of your age and physical condition, to prevent bad things from happening. Check out this article (external) to learn about my spine saving routine. Kitesurfing can indeed be a hell of a workout, but you have to be cautious to make sure it’s a positive one for your body! Kitesurfing can be practiced in a relaxed and easy way, resulting in a nice and mellow full body workout akin to fast walking. You can also kitesurf in a more athletic way, using an overpowered kite, in rough water conditions, doing hard carving or extreme jump tricks. This type of riding will provide you with much more intense sessions. In between the two, sustained upwind riding and long distance downwind carving can offer a strong muscular workout and calorie burning. Newer kiteboarders commonly report good weight loss after a few weeks of riding. You should consider cross training for kitesurfing, however, as this can really help you prevent injuries from the repetitive strain and posture constraints, namely on the lower back.